Could not open library '/usr/lib/kde4/kio_digikamalbums.so'. Once that’s done (and it’ll take a while) you’ll have 3 new packages in the parent directory of digikam-0.10.0, the Digikam package, a package for showfoto and a package for Digikams debugging symbols. Just use “sudo dpkg -i ” to install them. KDE 4 Beta 1 Released! Nokia to buy TrollTech ? There is another method though that means allowing digikam to rebuild the collection. Start digikam and go to Tools->Configure Digikam. Remove the “Local Collection” and add it again. It takes time to rebuild but it works thereafter. @Kanwar: didn’t work for me. Had to rebuild digikam as per Chris’ instructions. — Phonon includes NOT found! I have libphonon-dev and libqt4-phonon-dev installed. Any ideas? digikam build against the right libs is now part of the kde-experimental ppa, so compilation isn’t neede anymore. Both solutions didn’t work for me… Any ideas? I have KDE 4.3 beta 2, compiling worked, but I couldn’t install debugging symbols package…. I could install compiled digikam but it didn’t work – still albums with no photos. Readding gallery didn’t work. Updating from experimentall didn’t work – if anyone has any suggestions – very welcome. the workaround with deleting and readding the directory did not work for me – still no photos visible. 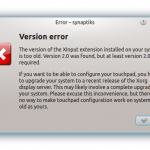 Following original instructions helped for Kubuntu 9.0.4 with DigiKam Beta 3.